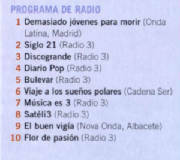 ROCKDELUX Nº 216 (2003) ¡Gracias a todos los que votasteis! "Looking At The Front Door"
"La Sonrisa de Esther Vilar"
"La Especie de Tom Sawyer"
"Un Amour Si Grand Qu'il Nie Son Objet"
"Take Him Back To New York City"
"Do Re Mi Fa Sol I Kiss"
"Cosmos Alone in the Lane"
"Africa Just Wants To Have Fun"
"You'll Need Those Fingers For Crossing"
"Here Should Be My Home"
"The Wolves (Act I and II)"
"Get Up Off A That Thing"
"Can I Be Your Squeeze"
"Love Is The Stick You Throw"
"The Blogger And The Dandy"
"I Belong Only To The Past"
"The Assumption As An Elevator"
"What Do You To Me?" "A La Sombra de Un Carajillo"
"Esa Luz Que Ella Vió"
"It Is A Relief To Give Up"
"First You See Me, First You Don't"
"Mahou No Hiroba (japanese single versión)"
"To Feel Is The Key"
"Jack Kerouac, I Didn't Know You"
"The Persecution and Restoration of Dean Moriarty"
"If I Had A Film"
"Johnny, Tu N'es Pas Un Ange"
"Can't Always Be Loved (Remix)"
"Una F-foto Tuya (Astrud Remix)"
"49 Ways To Leave Your Lover"
"Repetitive and Empty Song Exercise in Tonality (Fp-Vp Apr Remix)"
"Sometimes When I Get To Thinking"
"Love Song For A Stranger"
"Night of the Living Bassheads"
"Are You Gonna Thank Me"
"As Long As It's Love"
"New Talent Needed All The Time"
"Je Suis Un Soir d'Eté"
"I Wish I Was American"
"The Song of Summer Parade"
"Si No Te Vas Con la Tarde"
"Snow Falling In The Night"
"The Window Commands a So Dreamy View"
"Umi No Hanashi (micro versión)"
"Ballad of the Ship of State"
"I Rowed A Little Boat"